Each time I make a quilt, I spend a significant amount of time piecing the top. 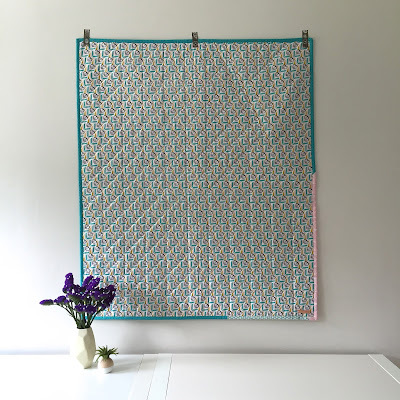 Depending on the size of the quilt, I spend anywhere from 2 to 13 hours rummaging through scrap bins looking for the right fabric, trimming blocks, ironing rows, and auditioning layouts on my design wall. While it takes quite a bit of time, I do love the process of creating a top. Piecing little bits of fabric together to create a larger design is so fulfilling. I do realize, however, that not everyone is in a position to be able to afford the higher price tag that a time-intensive quilt requires. 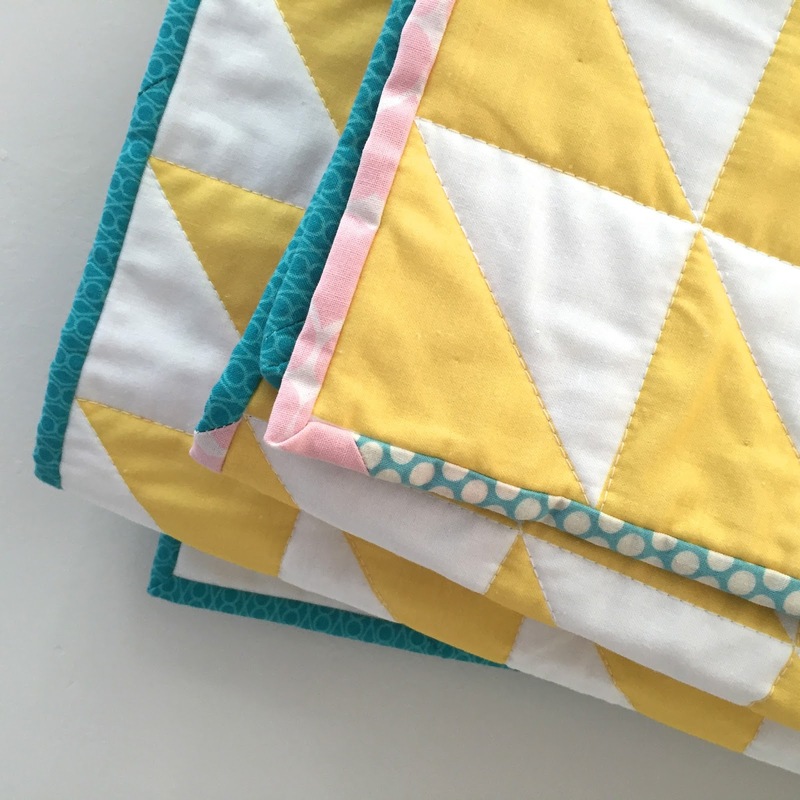 So I've been working on alternate ways to create quilts which cut down on production time, but still result in the high-quality product that my customers have come to expect from me. My gradual transition to machine-stitched bindings is part of this---hand-stitched bindings take anywhere from 3 to 4 hours, while machine-stitched ones can be done in 30 minutes to an hour and create a durable finish. 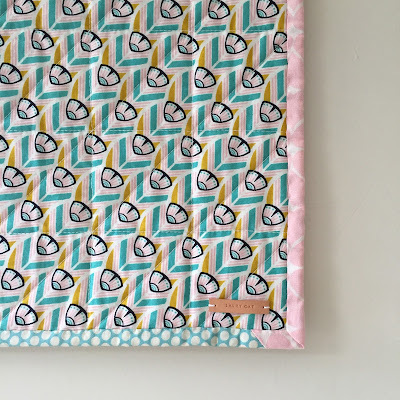 I've also started to experiment with creating modern whole-cloth quilts (sometimes also known as cheater quilts)---those with a quilt design already printed onto the fabric. 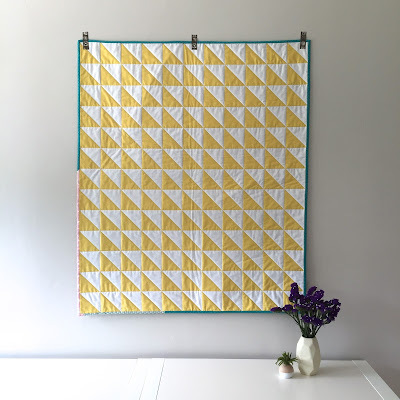 By cutting out the need to piece blocks, the amount of time needed to make a quilt is significantly less, thereby reducing the price of the finished quilt. I find this idea so exciting, with limitless possibilities! 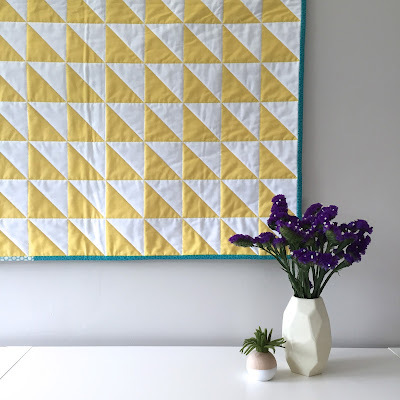 So today, I'm excited to share with you the first quilt I've made using this process. Of the whole-cloth quilt fabrics that I've come across (and there aren't many), most are rather dated in color and design, so I decided to design my own. I designed a simple yellow and white half-square triangle in Photoshop (Googling each step as I went! ), which I ordered and had printed through Spoonflower on Kona cotton. I basted the quilt as usual, using an organic modern feather print for the back, and then quilted along each of the design's lines. Because of that quilting, the top actually appears as if it were pieced. 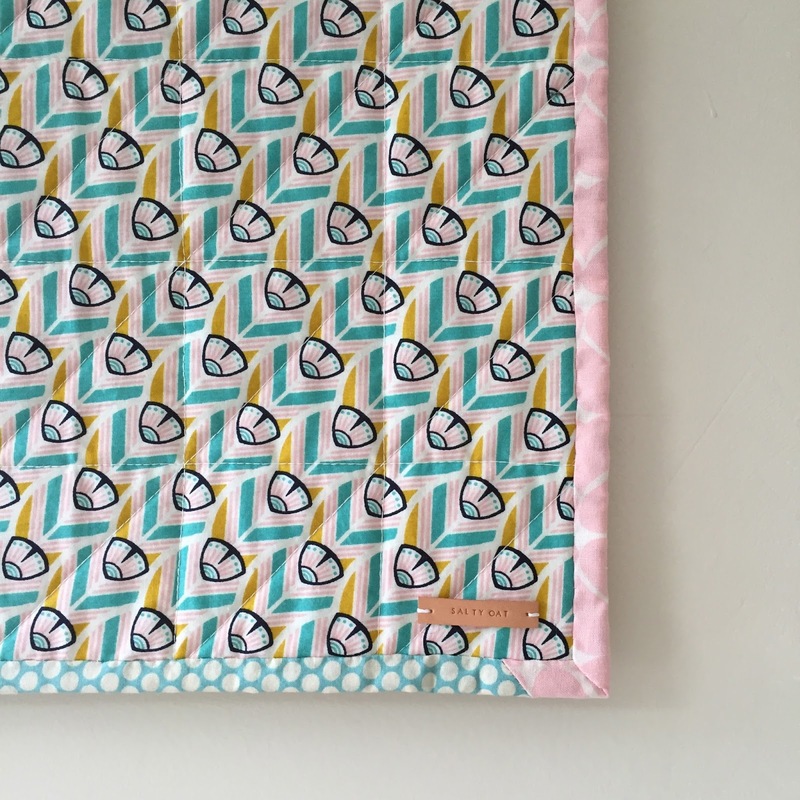 As I continue to explore the possibilities of whole-cloth quilts, I've asked a few other fabric designers and illustrators to design exclusive quilt tops for the shop. The initial sketches I've seen for the quilts so far are amazing, and I can't wait to share more with you in the coming months as we put the finishing touches on the designs. In the meantime, this quilt is now in the shop. If you like it, but would prefer a different backing or binding, let me know! The beauty of digital fabric printing is that I can print the same quilt top an infinite number of times, and then add unique finishes to make it different each time. I'm very excited to see where this project takes me, and hope you are too! Finished dimensions: 33" x 39"
Fabrics used include: Of a Feather (Ivory) by Rashida Coleman-Hale; digitally printed Kona cotton; Hearts in Cherry Blossom by Umbrella Prints.